The word locavore was the New Oxford American English Dictionary’s word of the year in 2007 (after being coined two years prior). Now, just a few years later, Girl Scouts can earn a locavore badge. As detailed here and here, senior scouts start working toward their badge by investigating the benefits and challenges of a locally based diet, locate local food sources, and eventually tackle a locavore challenge like preparing a three-course meal or making a complicated dish from scratch. Good stuff, right? It’s part of a larger push to update Girl Scouts badges for the 21st century after decades without major changes. One can’t help but wonder if this particular badge isn’t also an attempt to burnish the image of the Girl Scouts when it comes to food issues. They’ve gotten a lot of flak in recent years after two of their own scouts raised concerns about the use of palm oil in all but one variety of Girl Scouts cookies. The girls were motivated by concerns about the deforestation that results from palm plantations that destroy vital habitats of endangered orangutans. Until earlier this year, their campaign went largely rebuffed by the Girl Scouts national office, which went so far as to suppress criticism it was facing on Facebook. A couple months ago Girl Scouts USA finally acknowledged some of the issues that the girls were raising, but the changes they announced are, alas, largely toothless and don’t go anywhere near as far as the campaigners have been calling for. 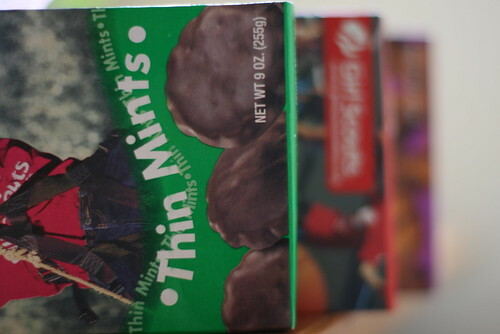 Seriously, I wish they would shift to “healthier” cookies. I want to buy, but the nasty ingredients stop me.